A couple blurry pictures and hazy memories of satisfied taste buds are the only things that remain from the bachelorette party version of this recipe. With half a dozen sous chefs (read: unsuspecting party guests) whirring around the kitchen, dicing and chopping and chatting about chiffon (hey, it was a bachelorette party after all), there wasn’t time or space for the executive chef to double as photographer. Of course, another reason there’s a big gap in our archival of food images for the day could be the emergency quest to find The Last Avocado in the City. When our only non-guacamole’d avocado proved unripe, I stopped mid-cooking, grabbed a sous chef and searched every bodega in a 5 block radius. 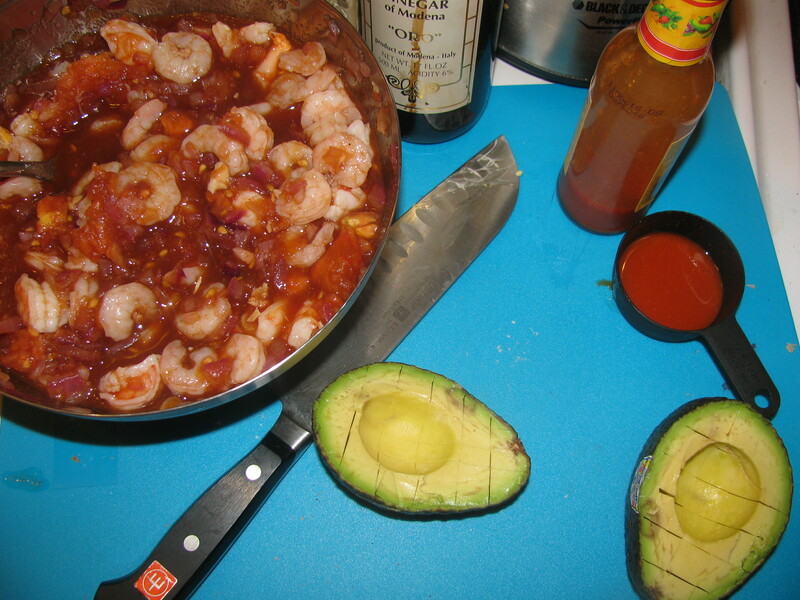 I’m sure the recipe would have been fine without the creamy avocado bits to contrast the salty shrimp, but why live in a world without avocado in your cocktail? So thank you to the Dwight Bodega for giving us your very last avocado. You may have restored my faith in the east coast. Luckily, my second attempt was less crazed in many ways. I miss having sous chefs, but it’s nice not to have to coordinate 8 dishes at once, and to finally have a grocery store in walking distance to alleviate some food crises. 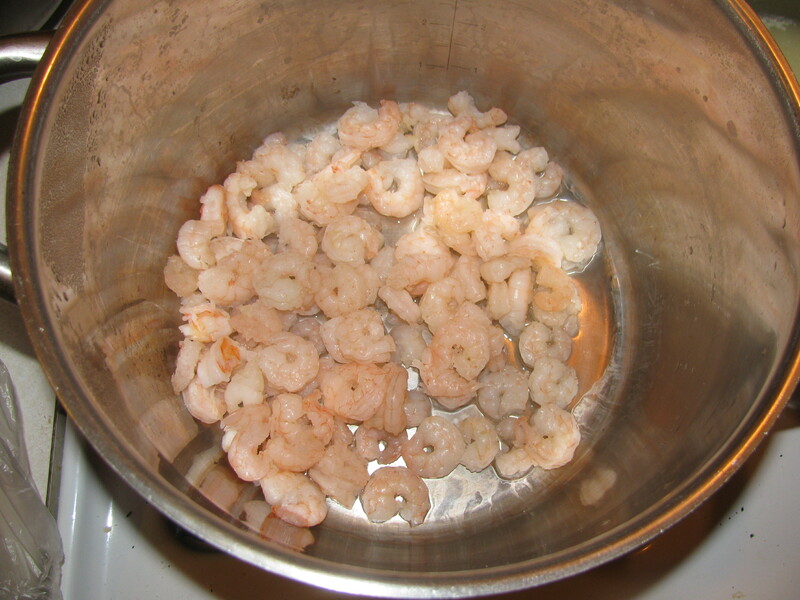 But the best part of Shrimp Cocktail Take II was that I didn’t have to share. Take II was all for me and me alone. To be enjoyed atop red chile crackers whose crumble and spice perfectly offset the gentle sweetness of the roasted tomato sauce. 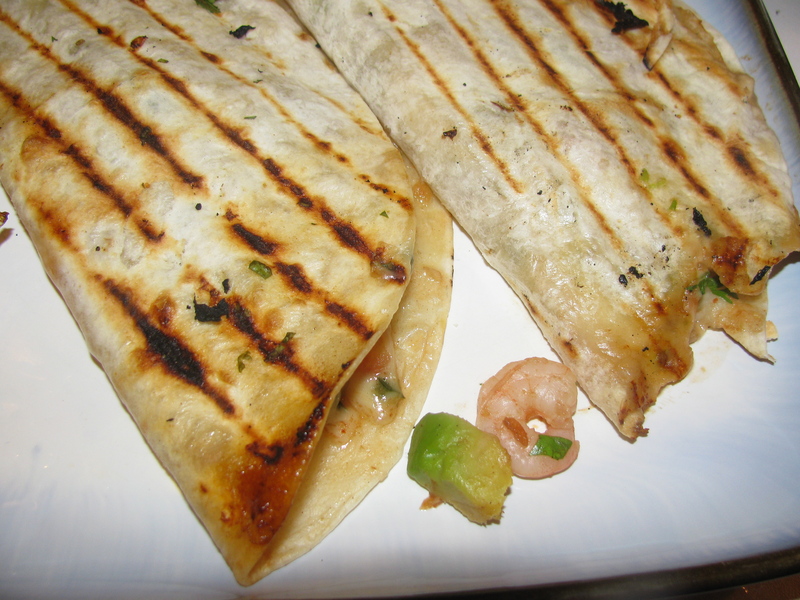 Or packed inside a tortilla with a cheesy sauce and grilled into a world class quesadilla. This might be my favorite recipe from that day in April, although it’s a Rosemary’s Baby-esque decision, so I’m not comitting. Let’s just say, if I could marry a food product, there would be a need for another bachelorette fiesta in the near future. Rick’s version includes octopus and offers advice if you want to use canned tomatoes, but this is the version we’ve made and loved. If you don’t plan on using this exclusively for quesadillas, I seriously recommend the red chile crackers below. They’re fairly easy to throw together and really bring this dish full circle. The cocktail is good without them, but sublime with them. Trust me. First get started on making the sauce. Roast tomatoes about 4 inches below a very hot broiler. Tomatoes are done when splotchy black and very soft, about 5 to 6 minutes per side. Remove and cool. Switch oven to 425 degrees. Add onion and garlic to the baking sheet and drizzle with oil. Roast for about 15 minutes, rotating a few times, until golden brown. Skin the tomatoes and throw into a food processor. Pulse a few times to chop tomatoes into small pieces. 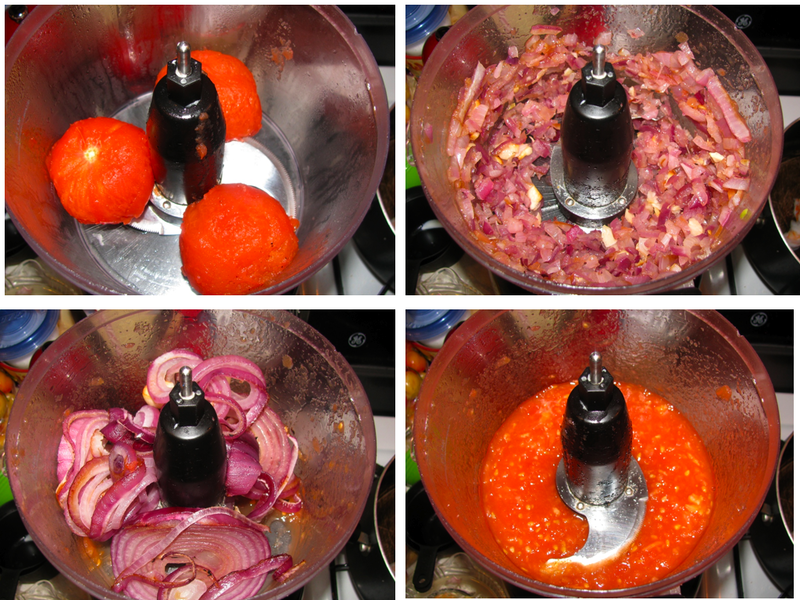 Transfer tomatoes to a bowl and then, without washing the food processor in between, add in onion and garlic. Pulse until chopped into very small pieces. Add to tomatoes and add vinegar, brown sugar and hot sauce. Just before serving add cilantro and avocado. 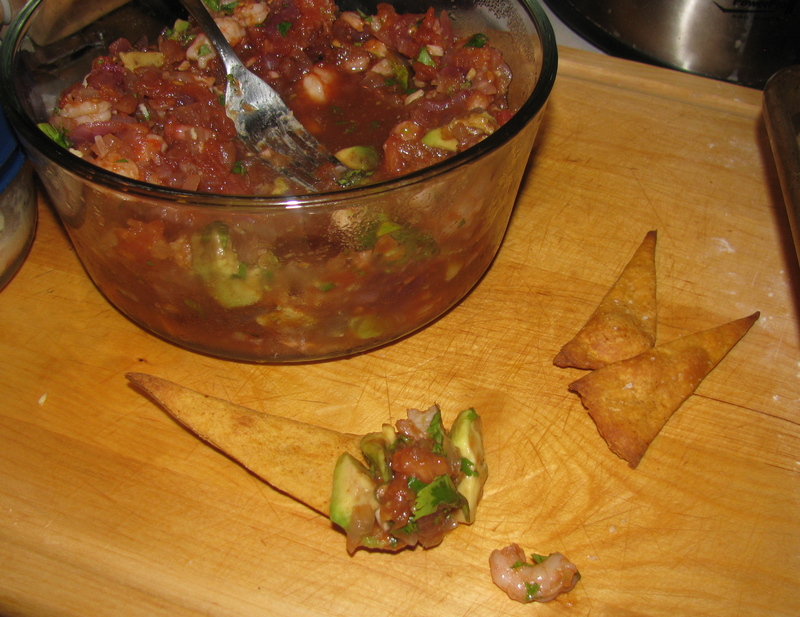 Rick provides recipes for both green chile and red chile crackers. The green chile version is a bright, refreshing snack on its own, but again it’s the red chile cracker that is the best vector for the cocktail. I don’t want to publish Rick’s entire book on our site, so make sure to pick up a copy to enjoy the green chile crackers. Pulse paprika, sugar, salt and flour in the food processor to mix. Add water and oil and process for about 20 seconds. Form dough into a ball and refrigerate for 2 hours or overnight. I must have this dish. now. This shrimp cocktail looks and sounds fabulous. Let’s see – so many impressions from reading your write-up. First off, blurry pictures or not, the description of this dish makes my mouth water. Second point: I am in awe of a daughter who can cook up her own crackers and act like it ain’t no big thing! There is no third point because I can’t get past the second point. You would love this cocktail, Mom. I’ll have to make it when I’m home again. And I challenge you to make crackers in the meantime. It seems like one of those things that would be tricky and difficult, but they’re stupidly simple. They’re roll-out cookies without having to soften butter. I should send you the recipe of the cilantro crackers if you’re interested. You could make it with the dough hook in your KitchenAid instead of in your Fisher Price food processor. Or you could make any of the cheesy crackers Deb has on her site, which the boys might like more. The crackers are AMAZING. I ate leftover crackers like they were, well, crack. Wait, I guess people don’t eat crack. I don’t really know how drugs work. Anyway, they were AMAZING. The cilantro crackers are also phenomenal.